Red Barn Chicken/Liver Roll Food Medium 2 lb.3 oz. Our Chicken & Liver Dog Food Roll is a favorite with most dogs and will surely satisfy even the most finicky eater! Redbarn dog food is highly versatile and can be used as a complete and balanced meal, a protein supplement to dry food, as a treat, training tool or as an aid for administering medications. 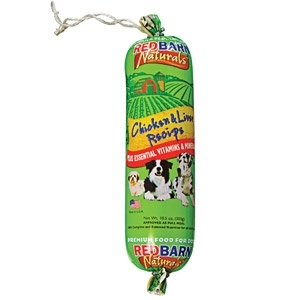 Red Barn Chicken/Liver Roll Food Small 10 oz. Red Barn Beef Roll Food Small 10 oz. Our Beef Dog Food Roll is a favorite with most dogs and will surely satisfy even the most finicky eater! 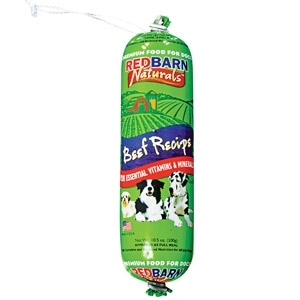 Redbarn dog food is highly versatile and can be used as a complete and balanced meal, a protein supplement to dry food, as a treat, training tool or as an aid for administering medications.